This is possibly the most obvious of the five topics being discussed in this series. The good thing about it is the benefits and arguments for it are pretty obvious, the bad thing about it is the benefits and arguments for it are pretty obvious. This means it makes a crappy discussion topic, though to do this series and not include it would be stupid. But obviousness and arguments aside adding a bike to your playlist of transportation methods is pretty much one of the best things you can do. For you, and for everyone. It’s good for you. Chances are you aren’t as active as you should be and probably tell yourself all the time that you should be doing something but never get around to it. Excuses not to exercise are easy to come by, mostly who has the time? 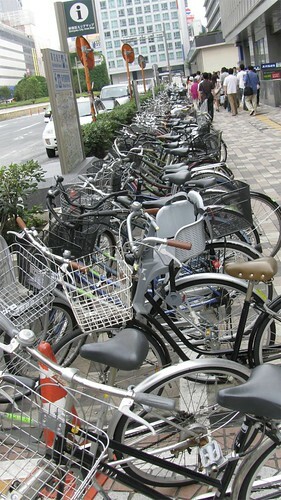 A bike is a great way to run small errands in your neighborhood and a few short trips leads to a few longer trips. It really is that simple, the more you do it the easier it gets and the more you want to. Additionally, when you suddenly realize how nice it is to run tot he coffee shop and not have to worry about parking or pay the $50 ticket you got while inside the shop a bike becomes much much more attractive. But this isn’t about you, it’s about the world. If you are biking someone where there’s a very good chance you aren’t driving there. This means less pollution, less gas usage, less support of the gas industry, less congestion on the streets and parking lots, and more efficient use of your personal energy. It’s also hecka cheaper. But most importantly you don’t have to go from never riding a bike to riding everywhere all the time to make a difference. Start small, get a bike and ride around your neighborhood. You’ll see how fun it is and start adding short errands. Ride to the corner store or to a friends house. If you work less than 5 miles from your house, try riding your bike to your office and see if that’s something you could reasonably do once or twice a week. I bet it is, and small steps like this lead to bigger one, and one person sets an example for others. Like I said, this one is the obvious topic in the discussion, but it’s important. So give it a shot. I fully agree, as you know. I just had a friend ask me how I am able to ride so far now, and gave her the same advice. Now I am attempting it fixed, and will start the same way. Short trips/ hills, then slowly expand. I’m afraid of drivers/traffic. That’s really what keeps me from investing in a bike. It’s also why I don’t like riding motorcycles. I don’t trust other drivers. OK this step is easy. I was a douchy, lyrca wearing roadie in the 80s, raced mountain bikes in the 90s and have been commuting on and off the entire time. I love seeing bicycles reach new people with the current popularity of fixed gears! Small caveat – Some employers are more bike friendly than others. Not everyone is OK with you changing your clothes in the company bathroom after a long ride into work in the Summer heat. Ask your boss how they feel about it first. Some day I’ll get around to buying something other than my cruiser. But for now, it’ll do.